I had a perfectly lovely day Monday. I was off and with the kids in school and John at work, Moose and I enjoyed a very peaceful and productive day. I did a little Christmas shopping in the morning and I found a beautiful lace tablecloth for my Thanksgiving table, bargain priced! I came home and organized a few things in the house, worked on the grocery list for Thanksgiving, and just enjoyed the quiet which I knew would end at 2:15 when the bus pulled up to the house. 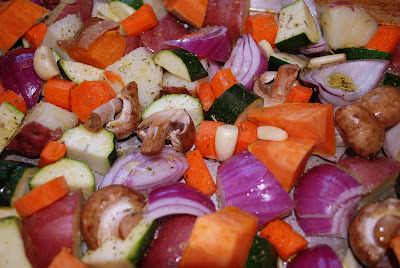 I also prepped my vegetables for one of my favorite dishes....roasted vegetables. If you haven't tried roasted veggies, then you have no idea what you are missing. 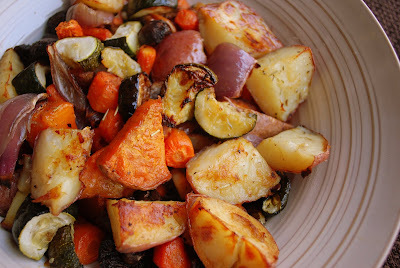 Roasting brings out a depth of flavor in vegetables that is simply amazing. It puts boiled veggies to shame. I could eat a whole pan full of roasted onions all by my lonesome. Roasting brings out the sweetness and nuttiness, then you get he crunch factor too. Perfection. Even my picky Evan will eat vegetables that are roasted that he would never eat normally. I've converted people who tell me they hate brussel sprouts but presenting them with a plateful of golden brown roasted sprouts drizzled with balsamic. Oh how I love them. The best part....roasting veggies is super easy. Gather up your favorite veggies. 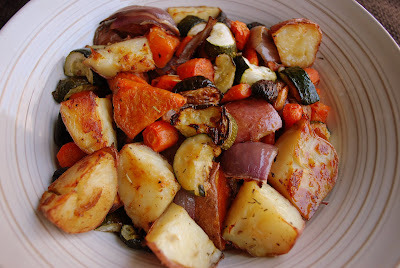 This time around I used red onions, mushrooms, carrots, zucchini, sweet potato, red potatoes, and some garlic cloves. You can use whatever veggies you like. Just try and chop them all about the same size. I threw the potatoes in the microwave so I could give them a head start, otherwise the rest of the veggies would be done and you'd still have raw potato. Ok so now you chop all the veggies up so they are relatively the same size. I seasoned mine with salt, pepper and some herbs de provence. Toss with some good olive oil and pop into a smokin' hot 400 degree oven. I set the timer for 30 minutes, flipped them over and set the time for another 20 minutes to check for doneness. They should be nice and golden brown. I like to drizzle some balsamic vinegar over mine, that's optional, but highly recommended.